After months of leaks, rumors and speculation the Samsung Galaxy Note 9 has finally arrived, and while there weren’t many surprises left for the launch, this is still an exciting phone, with top-end tech and some innovative features. But how does it compare to the Samsung Galaxy Note 8? Samsung’s previous phablet flagship is just a year old and still a great handset in its own right, so how much has really changed and improved here? To help answer that question we’ve put the two phones head to head, comparing them across all the key categories, from design to screen to camera and beyond. From a design perspective not much has changed. The Samsung Galaxy Note 9 has slim bezels above and below its curved screen, just like the Samsung Galaxy Note 8. Both phones also have a metal frame and a glass back, with the main visual change simply being the position of the fingerprint scanner. On the Galaxy Note 8 this is to the right of the dual-lens camera, while on the Galaxy Note 9 it’s just below the camera. That means it’s slightly lower down on the Note 9, and in a more central position that’s likely to be easier to reach for most people. Another difference is in their dimensions and weight, with the Samsung Galaxy Note 9 coming in at 161.9 x 76.4 x 8.8mm and 201g, while the Samsung Galaxy Note 8 is 162.5 x 74.8 x 8.6mm and 195g. There’s not much difference then, but the Note 9 is slightly shorter wider, thicker and heavier, but not as long. Oh, and for one final similarity: both phones are IP68-certified, meaning they’re dustproof, and water-resistant to a depth of 1.5 meters for up to 30 minutes. You won’t find a huge difference between the screens of these two phones either – though huge is an accurate description for both. The Samsung Galaxy Note 9 has a 6.4-inch 1440 x 2960 Super AMOLED screen, while the Samsung Galaxy Note 8 has a 6.3-inch display of the same type and resolution. That does mean the Note 8 has a marginally higher pixel density of 521 pixels per inch to the Note 9’s 516, but it's a difference we’d challenge anyone to notice. We’ll put the Galaxy Note 9’s screen to the test for our full review, but we expect good things, as our Galaxy Note 8 review concluded that its screen was excellent. The Samsung Galaxy Note 9 runs Android 8.1 Oreo out of the box, but while the Samsung Galaxy Note 8 has now been updated to Android 8.0, it started on Android 7. That’s relevant because while the software is similar now, the Note 9 will almost certainly be supported with updates for longer. Both phones have similar software highlights. There’s Bixby for one – Samsung’s AI assistant that comes baked in. Then there’s the S Pen stylus, which lets you write by hand as well as do useful things like write notes on the screen even when it’s off. However, the S Pen has been improved for the Galaxy Note 9 with the addition of Bluetooth connectivity, so you can click the S Pen to remotely play or pause music, take photos, present slides and more. And while it needs charging to use you can do so in under a minute. Another feature that’s been improved for the Note 9 is DeX. This is a feature that lets you hook your phone up to a monitor for a PC-like experience. But while the Note 8 needs a docking station for this, with the Galaxy Note 9 you just need an HDMI adaptor. As for the power, with the Samsung Galaxy Note 9 you’re getting a Snapdragon 845 chipset if you’re in the US and an Exynos 9810 elsewhere in the world. These are both top-end chips, and they’re the same as the ones you’ll find in the Samsung Galaxy S9. They’re also a step up from what’s in the Samsung Galaxy Note 8, with the US version of that phone having a Snapdragon 835 and the global model an Exynos 8895, both of which were top-end when the phone launched in 2017. While not top-end any more, they’re still very much in the upper echelons. The Galaxy Note 9 also has more storage and potentially more RAM, as there’s both a 6GB RAM model with 128GB of storage and an 8GB of RAM version with 512GB of storage. The Note 8, on the other hand, comes with just 64GB of storage and 6GB of RAM. Both phones also have a microSD card slot though – if you get the 512GB Note 9 and slot in a 512GB you'll be one of the first people packing a 1TB mass-market smartphone. Samsung has borrowed from the Galaxy S9 for the camera on the Note 9, which means it should be an upgrade on the Note 8’s snapper. The Samsung Galaxy Note 9 has a dual-lens rear camera, with one lens being a variable-aperture wide-angle one which can switch between f/1.5 and f/2.4, while the other lens is a telephoto one with a fixed f/2.4 aperture. Both lenses also sport optical image stabilization (OIS). Their features include 2x optical zoom, intelligent scene recognition (with the camera able to optimize its settings based on what’s in the viewfinder), and a flaw detection tool, which will alert you when you take a photo that’s, for example, blurred or one in which the subject blinked, giving you a chance to take a better shot before you miss the moment. The Galaxy Note 8 also has a dual-lens camera, but there’s no variable aperture here. Instead it has a 12MP lens with an f/1.7 aperture and another 12MP lens with an f/2.4 one. Both lenses do still sport OIS though while the f/2.4 lens is also capable of 2x optical zoom. The Note 8 lacks the Note 9’s intelligent camera features listed above, but it’s still capable of great shots. It also has an 8MP f/1.7 front-facing camera, just like the Samsung Galaxy Note 9. Samsung has massively increased the battery size for the Galaxy Note 9, bringing it up to 4,000mAh, from just 3,300mAh in the Galaxy Note 8. In our review we tended to find the Galaxy Note 8 offered all-day life, so we’d be surprised if you don’t get at least that much from the Note 9. We’ll be interested to see whether it can get far into a second day or not though. Both phones support fast and wireless charging, so juicing them up won't be a problem. 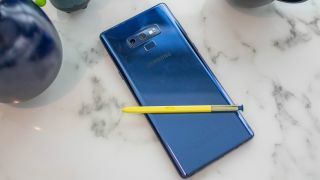 At the time of writing we don’t have price information for the Samsung Galaxy Note 9 in the Australia, but in the US and UK at least you’ll be able to pre-order the phone from August 10 and August 9 respectively, and it will hit stores on August 24 at a price of $999.99 (£899, around AU$1,350) for the 128GB model and $1,249.99 (£1,099, roughly AU$1,685) for the 512GB version. The Samsung Galaxy Note 8 is of course available now, and it’s a fair bit cheaper. It launched at $929 (£869, AU$1,499), but is now available for several hundred dollars/pounds less if you shop around. The Samsung Galaxy Note 9 looks very similar to the Samsung Galaxy Note 8, but under the surface quite a few things have changed, from the battery to the camera, chipset, RAM, storage and screen. Some changes are bigger than others, and few come as much of a surprise – especially given all the leaks ahead of launch – but on paper the Note 9 looks to be about what we’d expect. We’ll let you know exactly how well all the features come together, and just how good the Galaxy Note 9 is, once we’ve had more time with it, but based on the specs it looks set to please Note fans, while the Galaxy Note 8 has now become a far more affordable but still fairly high-end option.